Sometimes you don’t have the email addresses of your target group or you wish to ask your website visitors to take part in your survey. 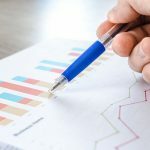 One option is to put the survey link somewhere on your website. Experience has taught us that in this occasion mostly people with an outspoken (positive or negative) opinion will respond. A pop-up is a script that runs as soon as a page is displayed causing your invitation to “float” over the existing page. Because no separate window is opened, pop-up blockers will not block this script. As soon as a respondent clicks “yes” a new window containing your survey will appear on top of the existing one. This window will not be blocked either because by clicking “yes” the respondent has given permission to show the new screen. A pop-under is a new window that appears underneath the existing one. People will only see this window when they close their browser. If you choose this option, the aforementioned pop-up script will run first asking visitors to take part in your survey. The survey itself will then open in a separate window underneath the existing page. Respondents can fill out the survey as soon as they are done with their visit. Our pop-ups and pop-unders will appear once per visit until your visitor has clicked on “Yes, I will!” or “No thanks”. From experience we know an incentive does wonders for your response rate when using a pop-up or pop-under. So definitely add one to your invitation, if possible! 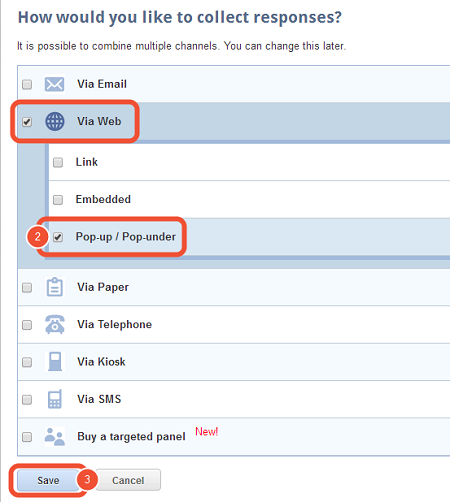 Please follow these easy steps to add a pop-up or pop-under to your website with CheckMarket. 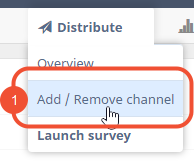 After creating your survey, click Add / Remove channel (1) under Distribute. 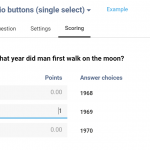 Then select Via web: Pop-up / Pop-under (2) and click on Save (3). 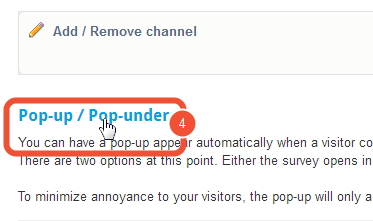 Click on Pop-up / Pop-under (4) on the screen that appears to set up the pop-up or pop-under. On the Scripts tab, you will find the script that your webmaster can use for your website to set up the pop-up or pop-under. On the Settings tab, you can make personal settings such as size and position. Here you can also activate the option Pop-under. There are two options at this point. Either the survey opens in a new window at the start of the visit (pop-up), or you can specify that the survey will only appear when the visitor leaves your website (pop-under). Texts for personalisation can be set up on the String tab. 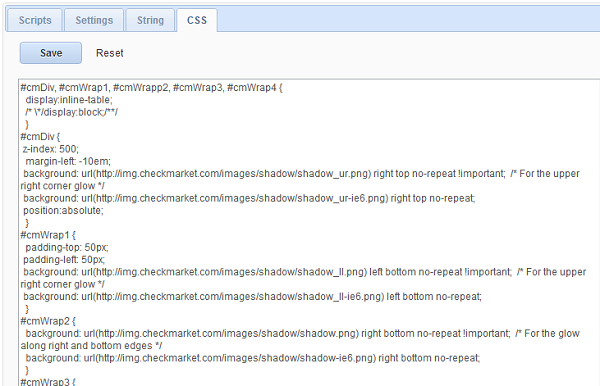 On the CSS tab, you can configure your pop-up or pop-under lay-out by adding styles to the various elements. 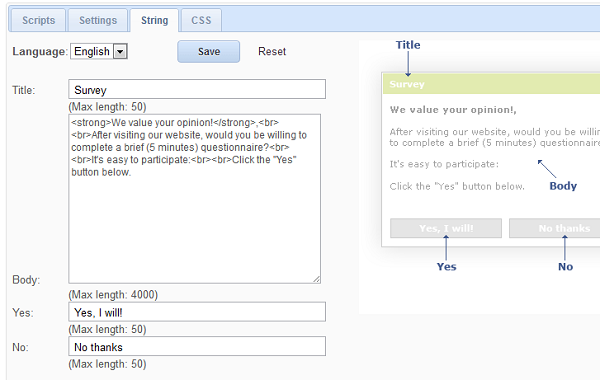 First add the parameter “&a=0” to the survey URL in the pop-up script. “Autoshow” will then be turned off. In order to make the pop-up appear, add the code “CM.PU.show();” to your script. Combined with a “setTimeout” function the pop-up will only appear when the time in this Timeout has passed. For example: the code “setTimeout(CM.PU.show, 3000);” makes your pop-up appear after 3 seconds. A callback ensures a certain function is only carried out when another function is completely finished. 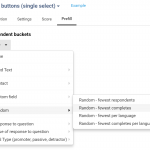 With a callback you can, for example, call a tracking script such as Google Analytics and thus register how often your survey was opened via the pop-up script.